Thank you very much for taking your time to answer to our questions today. First I would like to ask Aya: Why were you interested in overseas study? Aya: Ever since I entered university, I wanted to go to foreign countries. At first, I was specifically interested in Germany, and figured that studying abroad was the only way to really study intensively and to see the actual location. So I decided to study overseas. Why were you interested in Germany? Aya: When I was in elementary school, I liked the German author Michael Ende. I also used to listen to classical music like Beethoven and Brahms, and played it on the piano. That was my motivation. What parts of German literature do you like the most? Aya: I like children’s literature and fantasy. I think that compared with things like British literature, it’s not just fun to read, but after you finish the story, German literature makes you think. That’s what I enjoyed. 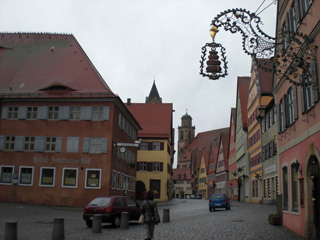 What did you think about Germany before you went there with the HUSA program? Aya: It was ambiguous. It was sort of a “fairy tale land”, that was a very western, “European” place. Aya: When I was a first year student. At first, I had to study grammar. My grammar teacher was very nice, and my interest in German increased. I used to think that grammar was too much of a bother. So it meant a lot to me that I was able to learn it while having fun. I didn’t learn just grammar. I also had classes by a native speaker and – more than anything – I enjoyed interacting and communicating with the local people when I studied in Germany. That kind of conversation was the best way to improve my German. What was your impression when you went to Hamburg? Aya: My first impression was “Cold!”. Although it was middle of September, it was really cold in the morning and evening. I was also impressed by the numerous cobblestone streets – something I only knew from literature- and I was very excited to be able to walk on them. How was your daily life in Hamburg? Aya: I stayed in a student dormitory. There were not only local students, but students from all over the world and the place had a strong international flavor. My neighbor was a female student from Mexico. Looking back, I think it was a beautiful time. Of course, there were problems too, but I mostly remember the good times. 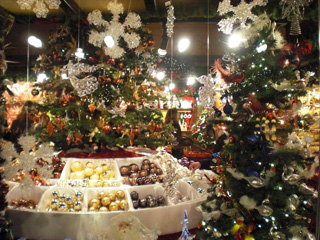 Aya: One example would be the Christmas market. Almost every town in Germany has one. It’s extremely beautiful and it was great fun to go there with friends. One more attraction in Hamburg is the Hamburger Dom that happens three times a year. There are lots of attractions like a Ferris wheel and roller coasters. It’s free to enter, but costs money to go on the rides or use the stalls. What was your major at the University of Hamburg? 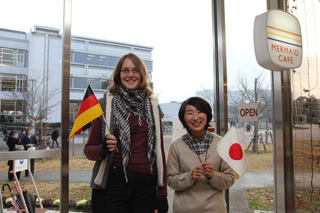 Aya: At the University of Hamburg, since all Japanese students are part of the Japanese Department I was part of the Japanese Department too. I was able to search for literature there that was helpful for my own research on German children’s literature. Did you go to any locations connected with German literature? Aya: I didn’t go to many places in Hamburg that had literary connections. I went to many places in other cities though. Like Weimar, related to Goethe and Schiller. Since you studied abroad, did your image of Germany change at all? Aya: I used to have a really broad general view of Europe and Europeans. That is, I came to understand things like the Germans in Germany do, and was able to tell the difference between people of various countries. It’s hard to explain how I came to understand it. Another thing was that I had heard German and Japanese have similar temperaments. But I really didn’t think that was the case. For example, what sorts of differences are there? Aya: Germans have strong opinions. It’s often said that Japanese can’t say “no”, but Germans always say it clearly. Another thing was I thought that Japanese are good at reading the atmosphere socially. As far as similarities go, I would say ‘earnestness’. I felt that when both Germans and Japanese have something they need to do, they try to do it well. How did your ‘romantic’ image of the country change from before you went to Germany? Aya: Of course the houses are all in lines like a fairytale, unlike Japan. Aside from that I also got the chance to actually touch historical places. 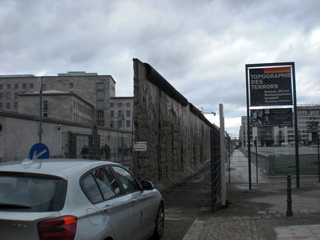 For example, when I was in Berlin, I was impressed to see that – in my eyes - the areas of former West-Berlin looked quite “advanced” compared with the parts of former East-Berlin. Also the city of Hamburg was almost completely destroyed by air raids, and there were many people who were grieving over the “loss of their hometown”. I felt that this sense of grief is mutual for both Germans and Japanese. Aya told us about her impressions of the German people. Janina, how do you feel about the Japanese? Janina: Aya is right. Germans say their opinion very clearly. Japanese people are different. Japanese only say their real thoughts when it is absolutely necessary. Aya said that before she went to Germany, her image Europe was like a fairy tale or “romantic” place. Janina: That’s hard to imagine for me. I was born and raised in Hamburg. The other German speaking countries are familiar to me too. I never thought that my hometown was a romantic place, but Hamburg is really nice. It has everything you might need and also a lot of historical buildings. Hamburg is very attractive for people interested in architecture. I can really recommend it. But “romantic”? – I would say “no”. . . . Sorry if I broke your expectations (laughs). Aya, when you went to Germany, you said that you felt not only a sense of romance but also the presence of history that thrives in Europe. What does Germany mean to you? Aya: When you say “Germany”, it is too broad. 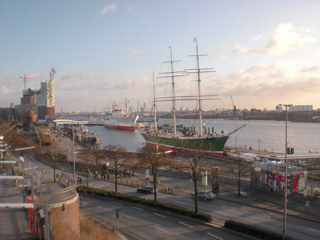 But if you mean “Hamburg”, where I lived for quite a long time, I like to say it is my “third home”. 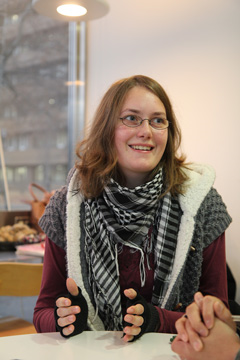 Janina, you studied Japanese studies at the University of Hamburg. Why did you decide to study that? Are Germans interested in Japan? Janina: No, I don’t think so. There are some people who are interested in it, but for most Germans, Japan, China and other Asian countries are still exotic and mysterious places. When I was a high school student, because one of my friends studied Japanese I wanted to know more about Japan. She taught me a lot about Japan, and I became more interested in Japan and Japanese culture. 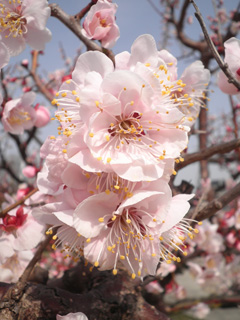 Then I wanted to go to Japan and intensively study Japanese, but it is really difficult to understand. The University of Hamburg has a department of Japanese studies. Aya, you also studied there, didn’t you? Did you have any teachers in common? Aya: Yes, there was a Japanese teacher , who was also a friend of a teacher in the Graduate School of Integrated Arts and Sciences in Hiroshima University. Janina: During the summer semester, I also took a lesson from that teacher. We read a Japanese newspaper and tried to translate it. Janina: It was interesting but difficult. Although I had studied Japanese for two years, there were many words I hadn’t seen before and it was very hard. Everybody was struggling through it like ‘What’s this?’ ‘I don’t know, ask your neighbor.’ We had to actually translate everything, but there wasn’t a single person in the class who understood everything. The contents were deep, and the teacher thoroughly explained it, but in spite of that it was really difficult to understand. You also studied Japanese culture and style. What was the most interesting thing for you? 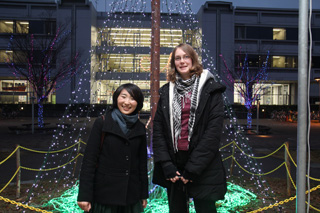 Janina: I would say that the most interesting thing is well… everybody is really nice and wants to help in Japan. Even if you get lost in the city, you can just ask a nearby person and they’ll try to help you. It’s something that doesn’t really happen in Germany. Janina: My university is partnered with several universities in Japan, and when we choose study abroad, our seniors told us about the good and bad points of where they went (laughs). What was your first impression like when you came to Hiroshima University? Janina: I came here in September, but I thought that it was a really fun place. It’s completely different than what I had imagined it would be, but I like how it is now. What is your daily life like here? Janina: Of course I came here to study, and I do that a lot (laughs). And of course, shopping. I’ve been to Hiroshima City and Miyajima … and recently I went to Okayama too. It was really great. My hobby is photography, so whenever I find something interesting I’ll take a picture of it and show it to my friends and family. I’ll say ‘Look! Look! This is the place that I went!’ (laughs). Also, as a subject, the lake and park scenery on campus are really nice. There’s a lot of green, and I think it’s a really wonderful environment. You are taking Japanese classes here. Has your Japanese improved? Janina: Well, I studied grammar a lot at the University of Hamburg, so that’s not as hard, but to me I feel like I really need a conversation class more. I can understand what the teacher and my classmates are saying, but I get frustrated when I can’t really express my answers well. In these past three months, what sort of things have you learned about Japan? Like customs or maybe some things that surprised you. Janina: A surprising thing was ‘punctuality’ … specifically the lack of it. In Japan it’s said that people are really strict about time, but it seems like students in Japan are often late. In Germany if you’re late it’s a really big thing. I heard that students also tend to sleep in class in Japan, but in Germany if you do that sort of thing it’s considered a lack of respect for the teacher and his/her teaching ability. (S)he will think “All right, it seems like my class is boring you,” and order you to leave the class. While you’ve been studying abroad, have you had any problems with your life here? Like being homesick. Janina: Nothing in particular. I’m enjoying my life here in Japan. I can use the Internet in my own room and I speak with my family and friends everyday on Skype, so I don’t get lonely. I do miss my pet guinea pigs though (laughs). Aya: For me, even though I had studied German for four years, at first I wasn’t able to understand anything. So there was a period of time where I secluded myself. 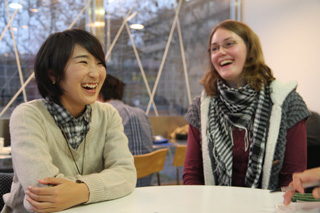 Aya: Because the University of Hamburg has a lot of ties with Japanese universities, I was able to become friends with a Japanese student and the tutor that I had over there would often take me out to have fun. Right now both of them are here at HU. Also, because I only studied abroad for half a year, in order to absorb as much as I could in such a short time I thought to myself that I needed to go outside, and gathered my courage. 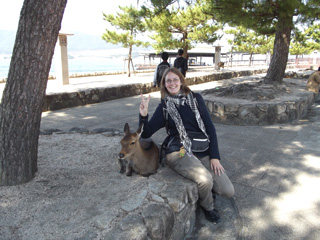 Janina, have you been able to make many friends at Hiroshima University? Janina: Yes, most of them are HUSA students. I’ll study with Japanese students at the library, and my mentor and tutor help me too. I speak in Japanese with my conversation partner. Even though I understand grammar and words, when it comes to conversation I’m not able to express myself well, and sometimes I think that my Japanese still has a long way to go. By the way, Hamburg has a harbor, doesn’t it? Is there a lot of seafood? Janina: Yes, there are a lot of shops near the harbor, and there’s a market where you can buy shrimp and fish and any sort of seafood. It’s fresh and really cheap. Aya: I went to that market too. I don’t like fish very much, so it was just to see it, and it was worth getting up early. It was great. Hamburg is completely different from the image we have in Japan of a port city. It’s not that it’s close to the sea, there’s a large river, and that’s where the port is. It doesn’t feel like at all like a city near the sea. What did you do for cooking while you were in Hamburg? Aya: For food I ate spaghetti a lot. It’s really cheap. Since it’s a large city there were a lot of Asian style shops where you could buy soy sauce, mirin, vinegar … anything. Sometimes I would buy that and make it with a little Japanese flavor. Germany is also famous for sausage, right? Janina: Of course. I miss German sausage. Japanese sausage is all too sweet. Putting sugar in sausage is unbelievable to me (laughs). Janina, what sort of cooking do you do in Japan? Janina: A lot of different things. Because fruits and vegetables are expensive here, right now I’m looking for a grocery store with cheap vegetables. I like cooking, but I don’t know how to prepare Japanese ingredients and am looking for a good cookbook. Janina, do you have any advice for students who want to study abroad in Japan or at Hiroshima University? Janina: If you have a friend that currently lives in Japan, it would be good to get various information from them in advance. Since, for example, when you hear ‘Hiroshima’ you have an image of a really large city, but the university is actually in a quiet town. I think you should really get information about where you want to go before you come here. What do you want to do after you go back to Hamburg? Do you have anything you want to try after you graduate from the University of Hamburg? Janina: I haven’t decided yet. I’m not studying Japanese because I want to be a translator, it’s because I like it. I’m still undecided about what to do after graduation. My goal is to first go back to my university and get my Master’s Degree. Aya, do you have a dream for the future? Aya: Although I’m in the process of job hunting, I’m undecided too. In the future I think that I want to translate German children’s literature, and introduce it to Japanese children. Because it’s highly competitive, I’m not really sure what will happen, but in any case I want to be involved with the German language. Aya, this is the last question, but do you have any advice for students at Hiroshima University that want to study abroad? Aya: I think that people who want to study abroad are already quite internationally minded, but even with that there’s still going to be a lot that they don’t know. The thing that I came to understand the most when I studied abroad was to not worry about ‘is this going to be helpful for my future?’ The important thing is just to get as many experiences as possible. That’s something that’s also said to people who aren’t interested in study abroad, but I wonder if it’s not a good idea to go abroad at least once. Thank you both for meeting me today. Janina, while you’re here please promote Germany to your Japanese friends. Maybe their desire to study abroad in Germany will increase. Janina: That would be wonderful (laughs).